This package consists of the textbook plus an access kit for MyMathLab/MyStatLab. 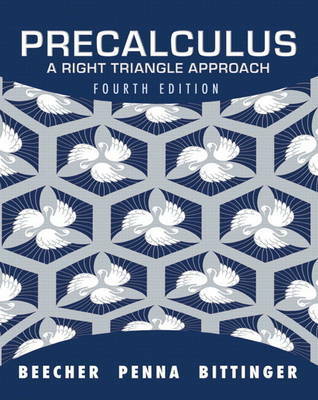 Beecher, Penna, and Bittinger's Precalculus: A Right Triangle Approach is known for enabling students to "see the math" through its focus on visualization and early introduction to functions. With the Fourth Edition, the authors continue to innovate by incorporating more ongoing review to help students develop their understanding and study effectively. Mid-chapter Mixed Review exercise sets have been added to give students practice in synthesizing the concepts, and new Study Guide summaries provide built-in tools to help them prepare for tests. MyMathLab has been expanded so that the online content is even more integrated with the text's approach, with the addition of Vocabulary, Synthesis, and Mid-chapter Mixed Review exercises from the text, as well as example-based videos created by the authors. MyMathLab provides a wide range of homework, tutorial, and assessment tools that make it easy to manage your course online.